Restylane is a safe, injectable dermal filler used in our Los Angeles dermatology practice to plump up creases and fine lines to rejuvenate the skin. American Skin Institute offers Restylane in Sherman Oaks, Westlake Village and Beverly Hills. This treatment option is a hyaluronic acid dermal filler that reduces the appearance of wrinkles by adding volume under the skin. To schedule a Restylane consultation in Sherman Oaks, Westlake Village or Beverly Hills, please contact the American Skin Institute practice near you. *Actual Restylane patient. Individual results may vary. Photo courtesy of Restylane. There are several reasons why wrinkles may form on the face. In some cases, these lines appear because of repeated facial movements. Frown lines and crow’s feet are examples of such wrinkles, and form largely due to the continuous creasing of the skin as we laugh, squint or furrow our brows. The repetitive movement causes the skin to crease; at first almost unnoticeably, but eventually leading to deep wrinkles. Other reasons for wrinkles include the natural aging of the skin and the deterioration of collagen fiber structures within. Proteins like collagen and elastin are responsible for keeping the skin elastic. This network of fibers is almost like a trampoline within the dermis of the skin, which helps the skin bounce back when it is pulled by facial muscles or gravity. However, as we get older, the body produces less and less of these proteins, leading to the deterioration of the support network under the skin. With less support, the skin can no longer bounce back, causing it to crease, wrinkle and sag. Restylane is a dermal filler that was created for the correction of wrinkles caused by loss of skin elasticity and even repeated facial movements. At the very core, Restylane acts to give the skin an additional layer of support, which tightens the skin from below to reduce the appearance of creases and wrinkles. 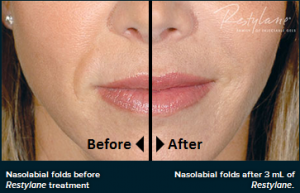 When getting Restylane injections in our Sherman Oaks, Westlake Village or Beverly Hills location, we will expertly inject this gel into the trouble areas, like nasolabial folds, frown lines or even the cheeks. The gel will provide you with immediate results, because it will take up volume under the skin and provide the much-needed support. However, the process doesn’t stop there, as Restylane continues to work for many months to retain the volume in the treatment area. This is because Restylane is formulated with hyaluronic acid; a chemical that attracts moisture to the treatment site. By drawing moisture to the area, the skin stays plumped up and the wrinkles remain smoothed. Although hyaluronic acid may at first seem dangerous (largely because of the word “acid”), it is actually a naturally-occurring chemical in the human body and is very safe. The risk of side effects or allergic reaction is very low. 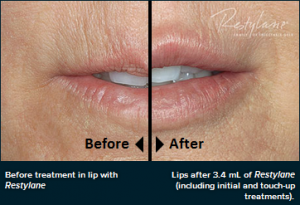 Restylane is a very effective dermal filler that has been safely used for many years all over the world. At American Skin Institute, we’ve administered hundreds of such treatments for our patients, with excellent results. When you visit our Sherman Oaks, Westlake Village, or Beverly Hills practice for Restylane treatment, you will see immediate results, before leaving the office. These results typically last 6-12 months, depending on your unique circumstances. At American Skin Institute, we are experts at effectively administering Restylane treatments to remove wrinkles. All of our providers are highly trained and achieve natural results for our patients. We don’t just aim to reduce the appearance of wrinkles, but to do it in a way that no one can tell you’ve had work done. 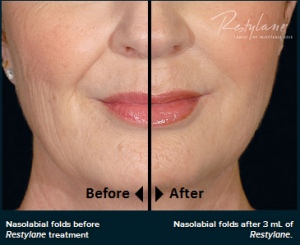 Please schedule a Restylane consultation in our Sherman Oaks, Westlake Village or Beverly Hills location to learn more about this amazing filler. Simply call the American Skin Institute practice nearest you, or fill out the Contact Form below!